MaineFIRST Robotics teams accomplish what they do because of the help of dedicated students, parents, friends, professional volunteers, corporate sponsors, school officials, community members, legislators...yes, even the Governor! Thank you to all who contribute in any way to MaineFIRST teams. 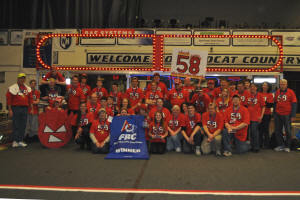 Help support the Maine FIRST Robotics Team in your area. Find out how. Write to loriaam@gmail.com. 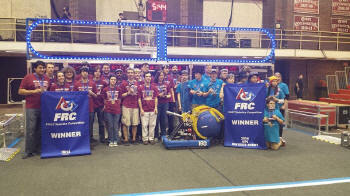 Is there a FIRST Robotics team in your town? If not, there should be! Note: Inactive teams can be reactivated by local interest! Click here to search for the most up to date team info at the FIRST Website. The 2019 FIRST Robotics Competition Kickoff Event at Hannaford Hall at the University of Southern Maine was held on Saturday, January 6, 2018. Streamed live from Manchester, NH by NASA Television to kickoff locations around the world, the Maine event is again scheduled to be at Hannaford Hall in the Abromson Community Education Center at the University of Southern Maine, Portland campus, thanks to the generosity of the College of Science, Technology, and Health; with additional support from the USM Office of the President; Office of the Provost; and the Office of Undergraduate Admissions. 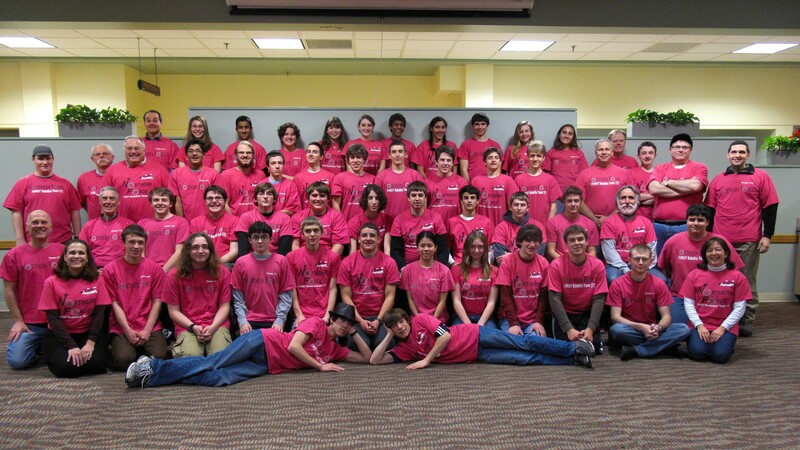 The MaineFIRST Coalition and website exist to support and celebrate FIRST Robotics in Maine. Maine has some great opportunities for kids to play hard at science and technology. FIRST Robotics is just that kind of opportunity, high school students working side by side with professionals in education and industry, developing skills and relationships that will last a lifetime. Help spread the word about FIRST, For Inspiration and Recognition of Science and Technology. 2019 Results for Maine Teams. Team 4564 Orange Chaos from Brewer HS received the Imagery Award, and was a quarter finalist. Team 5687 The Outliers from Baxter Academy in Portland, Excellence in Engineering Award, and District Event Winner for the NE District - Granite State Event. Team 6329 The Buck's Wrath from Bucksport HS, a semi finalist who won the Quality Award. Also participating at Granite State was Team 5265 Radical Impact from Cheverus HS and 5633 Hyde Cyber Wolves from Hyde School. 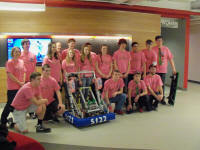 Team 58 The Riot Crew from South Portland HS was a semi finalist. 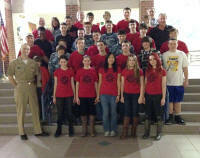 Team 172 Northern Force from Gorham HS and Falmouth HS won the Judges Award and was a quarter finalist. Also participating at North Shore was Team 3930 SMART from Spruce Mountain HS, and Team 5265 Radical Impact from Cheverus HS. Team 133 B.E.R.T. from Bonny Eagle HS won the Industrial Design Award, ranked 1st, Captain of Alliance 1, winner of the event. Also participating at Southern NH was Team 3609, the Duct Tape Dragons from the Boys and Girls Club of South Portland. Team 133 B.E.R.T. 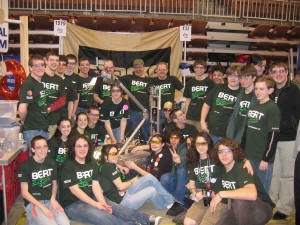 from Bonny Eagle HS was ranked 4th, picked by the #2 Alliance, was a finalist, and won the Quality Award. Team 3597 Robo-Rangers from Kittery was ranked 12th, was the captain of the #8 Alliance, made the quarter finals and won the Creativity Award. Team 5687 Outliers from Baxter Academy for Tech & Sciences in Portland was ranked #1, Captain of the #1 Alliance, overall winner, and also the winner of the Autonomous Award. Congratulations to all of our Maine teams! 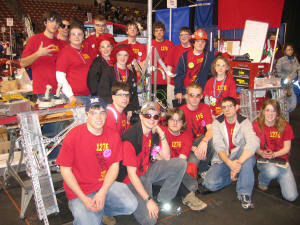 Also participating at UNH were Team 3451 The Anomoly and Team 6172, the Mad Dogs. If you are not competing please come and cheer on the Maine teams. Team Motto: Innoventers of the Future! Team Motto: Determine how strong you need it, then double it. Motto: If everything seems to be going well, you have obviously overlooked something. Motto: "Raising Aspirations, Raising Opportunities, Raising Success!" - 2012 Congratulations to our teams! 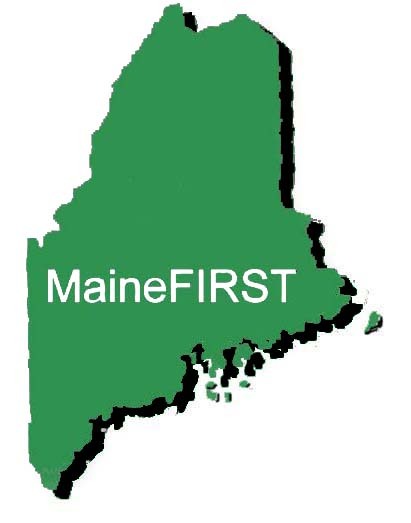 This resource is maintained privately for the benefit of MaineFIRST Robotics Teams.